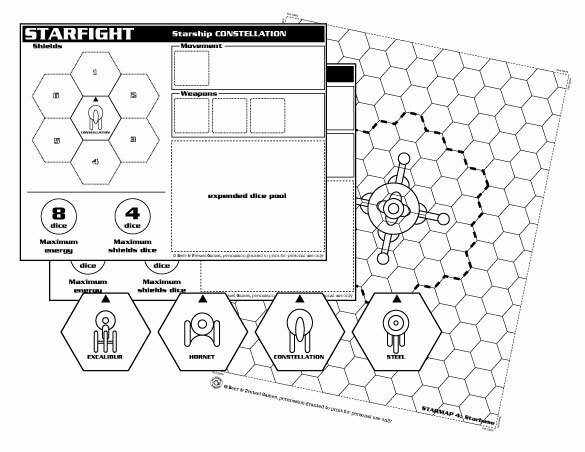 Starfight is a fast game of starships combat. The game is playable virtually by an unlimited number of players. You will need, beyond the content of this PDF file, a lot of dice: an average of 8 six-sided dice per player. Each player controls a starship and must destroy all the other starships in order to win the game. The game takes place in a time when the engines were not 100% efficient, therefore they produce energy in an incostant rate. The ships are all armed with powerful laser guns and use energy shields to protect themselves.